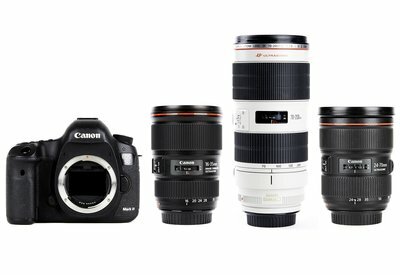 This is a great package for those who want to shoot a wedding with Canon's elite full frame camera and the best zoom lenses Canon offers. This adds to the 5D III Two Zoom Kit by also including the beautiful wide angle Canon 16-35 f/2.8L III zoom lens to the package which is perfect for those super wide, dramatic images your event clients love! This package is also fantastic for travel photography and basic portraiture. Feel free to add in other gear like a flash or CF cards or SD cards!